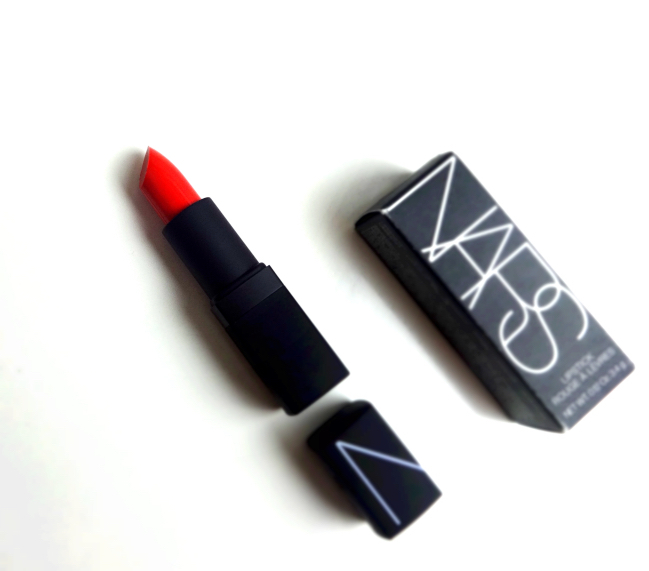 The name suits this famous lipstick from NARS. 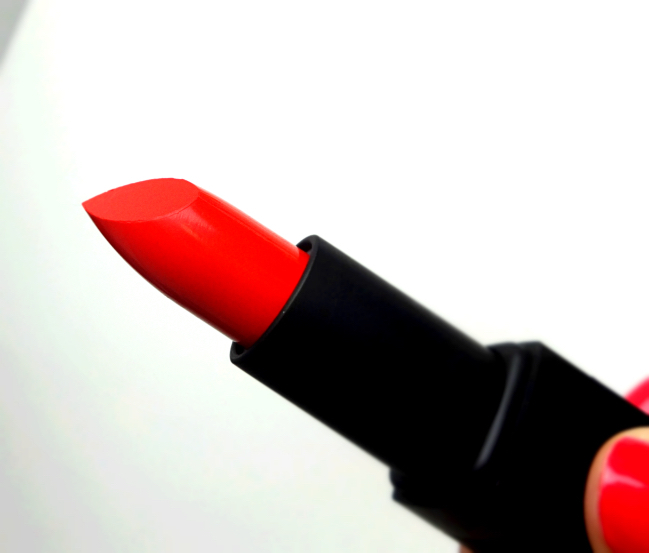 It is a blazing red with bright orangey undertones. I don't feel entirely comfortable wearing either warm-toned shades nor mattes, and this is why I hesitated quite a bit before I finally bought one for myself. I still find Heat Wave challenging and often wonder what would be the best makeup pairing with it. I do love the color so I brave myself and reach for it once in a while, though. It goes on vivid and opaque with one swipe. I would say the lipstick has medium weight - it feels creamy but not heavy. This is a red that clearly leans warm but not too yellow that it would look orange in real life. For comparison, I pulled out my other orange/red lipsticks with matte finishes. Bobbi Brown Valencia Orange is literally orange and yellower. Rimmel London Kate 110 is quite similar to the NARS but feels a lot more drying and smells weird, so it was chucked after contributing to this swatch. Here is an additional comparison swatch. In The Red and Really Red on the right are discontinued Revlon matte lipsticks, and I realized that they were so old and I only used them for comparison swatches. They were also discarded after this. (I just looked up and saw Really Red still lives in the revamped Revlon Super Lustrous range.) 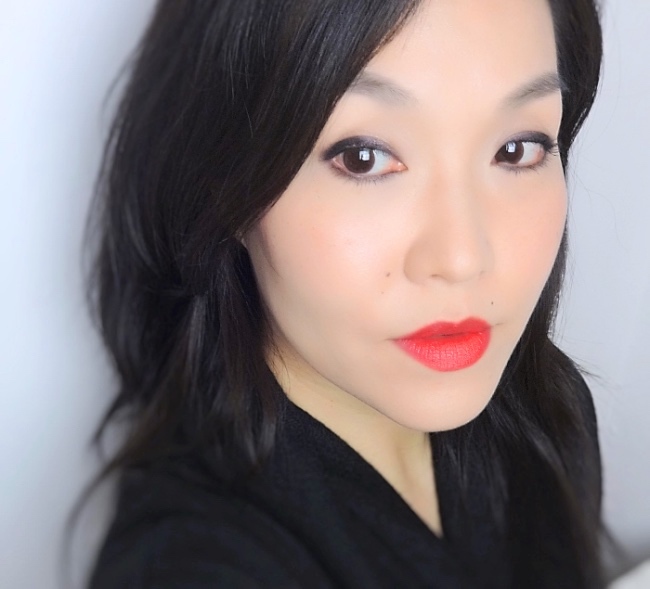 As you see, MAC Ruby Woo is the coolest one and Tatcha Kyoto Red is a cooler red than Heat Wave although it is kind of warm. In short, Ruby Wook looks best on my complexion as Heat Wave worst. Heat Wave looks somewhat aging on me so I tried rounder eye shapes to compensate. Um, it wasn't very successful. I think I should try pair it with cat eyes anyway. It doesn't feel that I have figured it all out with Heat Wave, but I can't deny this is an attractive and unique red in my collection. 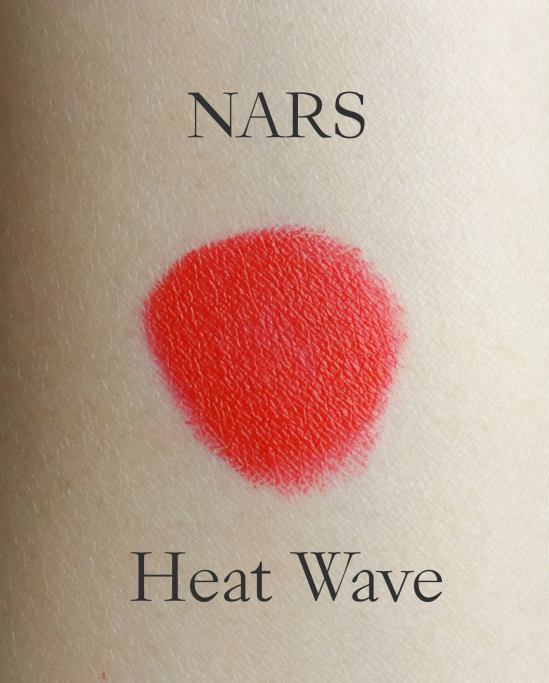 Heat Wave is a quality matte lipstick as well. I'd recommend it without reservation if you normally do better with warmer colors. I wonder how it compares to Dior 999 because it's also a very warm red! I find that I wear reds best when I soften the edges and make the shape less crisp. Less ageing for sure, more casual! I love Heat Wave, I wore it on my wedding day! I'm ashamed to say I haven't touched it since then, it is such a beautiful color. I wonder how Lana from the NARS Audacious lipsticks compares. It looks close to Kyoto red in your swatch. It is a striking and fun color on you. I haven't gotten a good red lately, but have a few NARS colors waiting for me. We'll see!